Polished and well-prepared rendition of Indian street food, inspired by Rasika executive chef Vikram Sunderam. 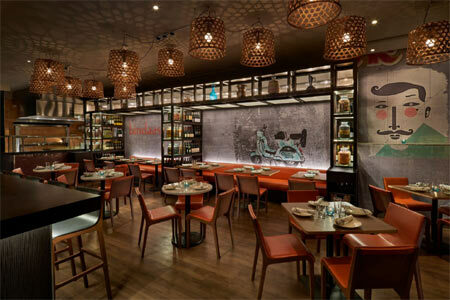 : Part of the Knightsbridge Restaurant Group of Ashok Bajaj, Bindaas offers a polished and well-prepared rendition of Indian street food in a contemporary setting. Almost every dish on the abbreviated menu beckons, and it’s nearly impossible not to order one or many of them from each section. Starting with “chaat,” a must-have is the bhel puri of puffed rice and raw mango, shrimp bezule (crispy and flavorful) and the avocado golgappa, a puffed biscuit full of an avocado purée and tamarind chutney. Among the kaathi roll, the Goan pork comes with a Kashmiri chili. From the shashlik (kebab) group, the lamb with saffron and an almond sauce and the chili salmon are tantalizing. Desserts include a kulfi (ice cream with cardamom and tinted with saffron threads) ice pop and a samosa filled with chocolate ganache. Plenty of wines and cocktails are available, so ask the waitstaff for guidance on pairings.